"You don't know what you've got till its gone". Well, we are allfeeling Kevin's work-induced absence. Not having that extra pair of hands around makes a big difference to what gets done...and my sanity. It means my opportunities to recharge and create are few and far between. Like Monday's post said, I have been focusing on things that are quick and satisfying so I don't feel like I am always being interrupted from a big project. It is purely a psychological trick, I know, but it makes me feel better to finish something. 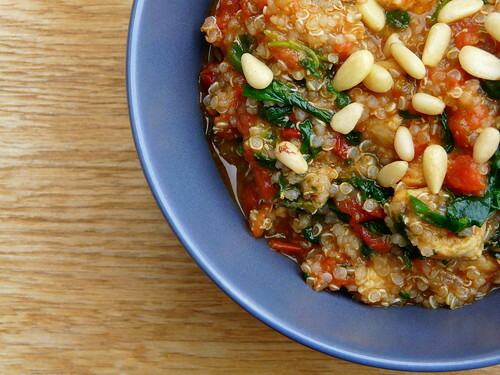 My quick-make meal of the moment is this quinoa dish. I don't normally share recipes because I don't ever measure anything so its difficult to pass it on...but I will try as this is a good one! 1. Cook quinoa according to the directions or however you do it. I just through a bunch of water in and boil the heck out of it until it turns translucent and the germ separates. 2. While the quinoa is cooking, stirfry the quorn pieces in olive oil until brown (if you are using them). 4. Add the beans, pesto, canned tomatoes, sundried tomatoes and garlic. Simmer. 5. When quinoa is cooked, drain it if necessary and stir in the rest of ingredients. Serve with pine nuts. This takes me about 20 minutes to make, start to finish. 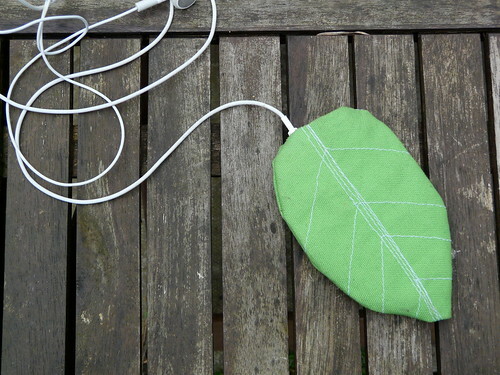 Another 20 minute project: Leaf iPod case. My mother had the great idea of making an ipod case using a similar pattern to the zakka life bag. I have been fooling around with prototypes to get it right as I found having the drawstring with the casing too fiddly to make on something so small (and then to use as I get mine out of the case 600 times to shuffle the songs). I think this is the right one. It has a small magnetic snap in the inside to keep the player in, but is easy to open. "Just a little green. Like the colour when the spring is born." Two years ago yesterday, Kevin phoned my dad as an April Fool's joke to say the baby had been born a month early. Two years ago today, the baby was born a month early. Happy Birthday, Wee E Man. I never wanted to get married. Its not so much that I was worried about divorce or unhappiness, it honestly just never occurred to me. I never dreamt of how my wedding would me and as I fantasized about my future, I was always alone. When I was at university, I began to become more resolute in my standing on the issue. I adopted the line used by one of my women's studies professors, "You wouldn't join a sports club that had a history of excluding blacks and homosexuals and subjugating women. Why would you join the institution of marriage?" Well, I ended up not having much of a choice in the matter. I fell in love with a Brit and the only way to stay in the UK was to get married*. So in 2001, we did it and I wore black. 1. He loses EVERYTHING. Keys, wallets, bank cards, mobile phones. He went through a 2 month period before Christmas where he lost something every week. The most astounding thing about it is that things ALWAYS come back to him. He suffers no long term consequences for his absent-mindedness. The best example of this is when I phoned him and the ticket office at Stirling station picked up and asked me if I knew if the person who owned the phone was, "A big bearded bloke with a baby." When I said that yes, that was him and I was unfortunately married to him, I was told to "give him a row." Which I did. 2. He hasn't done a load of laundry in 2 years. If he does manage to move something from the washer to dryer, he will not ever put anything away. It seems he has a strange form of carpal tunnel that prohibits any motion that resembles folding. 3. His cooking is more science experiment than culinary. I can't be in the kitchen when he cooks because I usually say something to the effect of, "What are you doing?" 4. He talks about work incessantly. At the minute, that means talking about 2 jobs...the one he is in and the one he is going to. I just can't understand it. I NEVER talk too much about any one thing, like slings, crafting or blogging. 5. He takes hundreds of self portraits. My computer is filled with them. 6. he has no respect for plans or lists. He would prefer to be spontaneous, even at the grocery store. Needless to say, we often have to make second trips. 7.He picks up a bit of every accent he hears...when we are in America, he actually says "bucks" like "it only cost 2 bucks". When we are with his South African family he starts saying, "Yah." and "Bett (bed)". 8. He owns about 40 work shirts. There is no room in the wardrobe for anything of mine because of all his shirts. However, he only wears about 5 on rotation. 9. He knows all of the words to the star wars movies. He can remember obscure lines from films made when he was an infant, but knocks on the door every morning about 2 minutes after he leaves because he has forgotten his keys/bag/phone/ipod. 10. He is the most wonderful father and husband I have ever seen in the flesh. His patience and understanding amaze me every day. He gives so much of himself to everything he does. He makes me laugh and keeps me in the moment. I am the luckiest woman alive.